Real Madrid will host Deportivo La Coruna in a La Liga match today at Santiago Bernabeu. James Rodriguez and Sergio Ramos remain on the sidelines along with Pepe and Luka Modric. 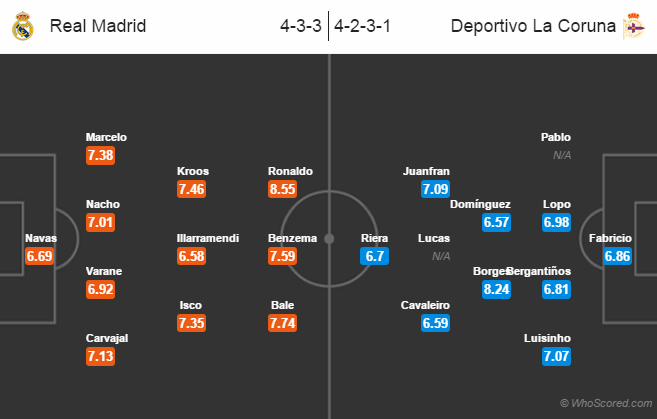 Real boss Carlo Ancelotti will have to start once against without star defenders Sergio Ramos and Pepe. Marcelo is back from his suspension and is expected to start at his favourite left-back role. Keylor Navas could replace Iker Casillas after the veteran had a disappointing game against Atletico Madrid last weekend. New signing Lucas Silva could feutre for the first time in a Real Madrid jersey. Sidnei has joined Hélder Postiga on the sidelines after suffering an injury. Alex Bergantinos is likely to start in the central defensive role. Celso Borges is expected to keep his place after impressing last weekend. Luis Farina is back after missing the last game through suspension. Both the sides have lost one of their last six La Liga games. Real Madrid have won 11 of their last 12 games against Deportivo. Real Madrid have scored more than two goals in six of their last seven games against Deportivo at Bernabeu. Only two matches have been drawn between them at Bernabeu in the history of football. Real Madrid 3 – 0 Deportivo La Coruna, Cristiano Ronaldo and Gareth Bale on the scoresheet.